Arniston Rangers are planning to move from their rundown Newbyres Park home to a brand new stadium at nearby Birkenside Park. Although the plans are still at an early stage, concerns have been raised within the local community about the move, with a special meeting of Gorebridge Community Council to be held on the matter next week. The Gorebridge club hopes to move because it can’t afford the estimated £750,000 renovation costs to bring Newbyres Park up to standard. The club previously planned to move to Gore Glen. The sale of the current ground will fund the new build. And the club plans to introduce direct access to the Birkenside site from the A7 to allay local parking fears. Despite repeated attempts by the Advertiser to speak to Arniston Rangers, the club has declined the opportunity to comment. Local councillor Jim Muirhead (Lab) can see the positives in the proposed move. 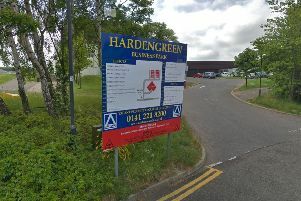 He said: “Many people have raised with me the lack of an all-weather pitch in Gorebridge like those located in many other areas in Midlothian. “The proposal from Arniston Rangers to relocate to Birkenside has the potential to meet this demand, while helping to safeguard the future of the club. “The provision of a facility like this could occasionally inconvenience some residents, wherever it is located. All that Arniston Rangers are asking for is that people don’t rush to judge and weigh up the advantages against the inconveniences before taking a view.